Stephanie has been seen often in the “Winner’s Circle” of the USAPA Nationals. She is a PE teacher turned Pickleball Pro. Stephanie is an excellent example of someone who has a lifelong commitment to physical fitness. Enjoy her pickleball story! I choose Paddletek paddles, especially the Phoenix Pro. From the first time I demo-ed this paddle, I felt I had the power AND touch I needed to play my best! I played small college tennis in Nashville. We did not have access to indoor tennis courts when it rained, so our coach kept a racquet or paddle in our hands in the gym. One of the sports she taught us was pickleball. When I decided to become a PE Teacher, this same coach, Trish Hodgson, explained the sport in more depth so that I could teach children how to play it. I included it in my curriculum for all 8 years I taught middle and high school PE, and students from all backgrounds LOVED it. I just didn’t realize that adults played pickleball too. Sadly, Trish, who gets the credit for my love of teaching & pickleball, died of ovarian cancer before knowing that I put down mytennis racquet to play on the “pickleball tournament circuit” all around the USA. I think I might be a tad better player indoors but I love the outdoors the most! The singles game comes more easily to me but I have grown to love mixed doubles the most. I have my tennis doubles partner Nicole Hobson to thank for teaching me the strategies & teamwork of doubles. She patiently & persistently took me step by step & converted me into a decent doubles partner, from my mindset of doubles being two singles games going on at the same time! I love playing in St. George, Utah. The Little Valley courts are beautiful and have a very special personalized brick placed there, in memory of my brother, Stephen Shouse. Some thoughtful friends bought the brick & presented it to me. The sibling rivalry I had with my brother is the reason I love tough competition so much. I still draw from that memory of competitive times with my brother in playing the game of pickleball. Have confidence & believe in yourself! Also, I think being cohesive with your partner is very important. Have a game plan, but be ready to change it if things aren’t working. Have fun & treat others with respect whether you win or lose. I’ve taught physical education for over 20 years. I enjoy teaching children & being a part of their growth, especially when the light bulb goes off and things begin to “click”. Finding an enjoyable physical activity while they are children plays an important role for them in being active as an adult. Do you mind sharing about your personal life? I have been married for over 20 years to Andy Lane. We have one daughter, LeEllen, who is about to begin her teenage years. She is playing pickleball in more and more tournaments. Pickleball is my daily dose of “feel-good” happiness! In the winter months when we play indoors, we are lucky if we get to play 4 times per week. However, in the spring, summer & fall, some of us are happiest when we get to play 6-7 times per week. I like a thorough warm-up. I play my best when I can hit several of the same shots that I plan to use in the match. Then it’s the icing on the cake if I can play a few live points, which tells me if I need to make any adjustments. I have been surprised that some top players do not want to know who they are playing until they walk onto the court; but I like to know who my opponents are ahead of time, which is helpful in establishing a game plan. 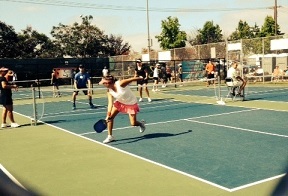 With pickleball being a lifetime sport, I hope to do just that….to play pickleball for the rest of my life! Thank you, Stephanie, for your dedication to life long fitness and for your love of the game! love your story Stephanie !